Operation Argus was the only clandestine test series in the 17 year history of atmospheric testing. It was secretly conducted in the South Atlantic, 1100 miles southwest of Capetown, South Africa. Argus consisted of three very high altitude test shots of the W-25 warhead to investigate the effects of nuclear explosions outside of the atmosphere - how the charged particles and radioactive isotopes released would interact with the Earth's magnetic field which could potentially interfere with radar tracking, communications, and the electronics of satellites and ballistic missiles. In a way, these tests could be considered a logical extension of the high altitude shots conducted within the atmosphere in Hardtack I which detonated warheads at 85,250 feet (a 1.7 kt W-25 in the Yucca shot), 141,000 feet (a 3.8 Mt W-39 in the Orange shot), and 252,000 feet (also a 3.8 Mt W-39 in the Teak shot). Argus pushed nuclear tests still higher with effects tests at 100 miles (528,000 feet), 182 miles (961,000 feet), and 466 miles (2,460,000 feet). The motivation for this secret series was a theory developed by the brilliant but eccentric physicist Nicholas Christofilos at Lawrence Radiation Laboratory (LRL). He had predicted that military significant effects would be produced by injecting charged particles from nuclear explosions into near space to create artificial Van Allen belts. This series sought to prove (or disprove) his theory by actually creating such a belt. Operation Argus has been termed the "world's largest scientifc experiment" encompassing as it did the space surrounding the entire Earth. The tests essentially confirmed his predictions. All three shots were launched by a specially modified Lockheed X-17A three-stage missile fired from the USS Norton Sound (AVM 1) which was operating as part of the 9 ship Top Secret Task Force 88. The W-25 warhead produced yields of 1.7 kt, as in previous tests. The plutonium implosion W-25 warhead was developed for the unguided air-to-air rocket Genie, and was exceptionally light for the time 218 lb (98.9 kg), dimensions were 17.4 inches (width) and 25.8 inches (length). It had previously been fired three times, so its yield and reliability was well established. The X-17A was 42 feet 10 inches long with the Argus payload, and had a diameter of 91.12 Inches. To investigate the effect of trapped radiation in the Earth's magnetic field it was important pick a test site where the magnetic field configuration could trap and hold charged particles efficiently - this dictated test between 35 and 55 degree (either north or south of the equator). The altitude limit of the available missile dictated a southern hemisphere test since the fact that the global magnetic field is centered about 200 miles off-center from the Earth's geometric center brings the stable trapping region 400 miles closer to the surface there. 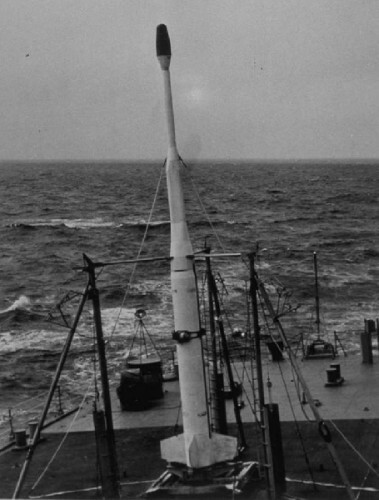 Although the W-25 was a LASL warhead design, Argus was actually conducted by LRL. The New York Times broke the story of this test series on 19 March 1959.